Pioneers in the industry, we offer hvof powder spray system, powder spray gun, hvof wire spray system and powder flame spray gun from India. With the help of our skilled professionals, we are providing an extensive assortment of HVOF Powder Spray System. This spray system is ideal to be used in medium to large shops which require high volume surfacing and enhanced quality control. Our products are widely known for their sturdy construction and compact design. We not only used best grade components and advanced technology in the making of products but also check them on numerous parameters before delivering to clients. Ideal for medium to large shops with high volume surfacing needs and increased quality control requirements.. Fully automatic operation for highly accurate and repeatable HVOF Coatings. Built-in monitoring and alarm system with automatic shutdown for safe operation. Interfaces with workpieces handling equipment, gun manipulators, exhaust system and accessories.. Ideal for small and medium shops with occasional surfacing needs. Precision components designed for reliable & repeatable coatings incorporating high safety standards. Customize your system with gun and part manipulation equipment ideal for your spray applications..
To meet divergent demands of the clients in an efficient manner; we bring forth HVOF Powder Spray System. The offered product is designed with superior quality components, using the latest cut edge technology under the supervision of adroit professions to meet the essential needs of the clients. Furthermore, the offered product is quality checked on different parameters to meet the standards set by the industry. We ensure the best price and timely delivery of our product. The MEX XPOJET-5000 uses an elegantly simple and effective design to produce High Pressure - High Velocity Liquid Oxy Fuel coating of superior quality. In Addition to the outstanding coating quality, the XPOJET-5000 delivers spray rates four times higher then typical HVOF systems. This dramatic increase in spray rate and productivity places the xpojet-5000 system in a new category of HVOF equipment. Known for our credibility in the market, we are engaged in providing superior quality range of Powder Spray Gun. It is widely used in automobile and paint industries. The offered product is highly acclaimed for its smooth performance, fine finish, and long service life. This spray gun is designed by using top-notch components and latest technology to meet the requirements of our clients. Further, we offer these at market leading price and ensure timely delivery. NET WEIGHT (WITHOUT HOSES & MOUNTING BRACKETS) 4.70 kg approx. Being a quality oriented organization; we are involved in offering a broad range of HVOF Wire Spray System. The offered high-velocity combustion wire spray system provides supersonic spray velocities and improved heating and melting of the wire particles. These products are developed in compliance with the industrial laid standards by using supreme quality components and ultra-modern technology. Moreover, we ensure stringent quality check of our products on various parameters and offer them at cost effective rates. 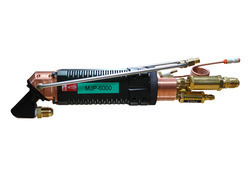 HIJET® is a New Generation High Velocity Combustion Wire Spray System (HVCW), which provides supersonic spray velocities, combined with improved heating and melting of the wire particles. With the goal of delivering qualitative products, we are engaged in providing our clients with an excellent quality Powder Flame Spray Gun. The offered gun is extremely versatile and offers premium coating for wear resistance, corrosion protection, thermal and electrical insulation etc. As per the global set standards, this spray gun is manufactured from quality assured components and the latest technology. 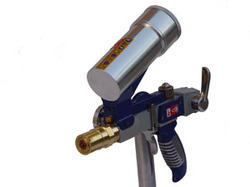 Additionally, we provide this spray gun in customized option at most genuine rates. The Powderjet-86-II Gun is extremely versatile and offers premium coating for wear resistance, corrosion protection, thermal and electrical insulation etc.. which have long been the attaindent goal of all the coating processes. The system can be made fully automatic or programmable. 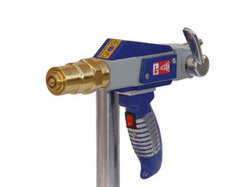 The heavy duty thermal spraying gun, 86-II is successfully used with varying spray rates, as high as 25 Kg/Hr, which shortens the spray time on large parts. The specially designed high performance nozzle, accelerates spray powders efficiently by feeding the powders directly into the flame center of gun & gives the consistent deposition efficiency for varied spraying. Standard unit is with Oxy-Acety gases but is also usable with Oxy-LPG/CNG gases for economy and cleaner environment. Optionally Oxy-LPG/CNG gases can be used for low melting powders like plastic powders to save fuel cost. The system is equipped with Reverse Flow Check Valve to ensure safety to operator.